Quick StartUp 2.3 is system maintenance software developed by Glarysoft. 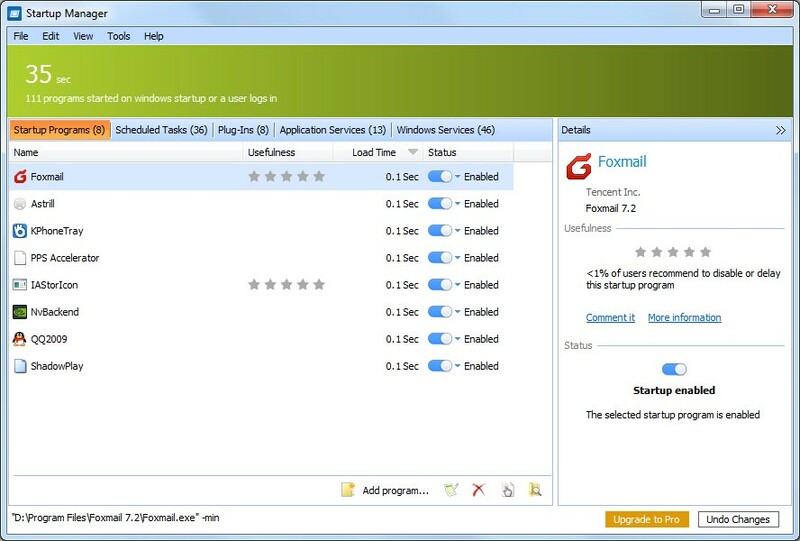 Quick StartUp was developed to provide quick access to all of the programs that are automatically started when you turn on or logon to your computer. Such programs consume a good part of your system's resources, and can slow down other programs. Using Quick Startup, you can inspect, edit, and/or temporary disable such programs and so on. This system maintenance software is freeware, which means you can download and use Quick StartUp 2.3 absolutely free. There's no need to buy the product. Quick StartUp 2.3 supports different languages (including English, German, Russian, French, Italian, Spanish). It works with Windows 98/XP/Vista. We have tested Quick StartUp 2.3 for spyware and adware modules. The software is absolutely safe to install. We has completely tested system maintenance software Quick StartUp 2.3 many times, written and published the interesting article and uploaded installation file (1278K) to our fast server. Downloading Quick StartUp 2.3 will take minute if you use fast ADSL connection.